Yesterday the BBC published an online article entitled Why speaking English can make you poor. Essentially the research reports that speaking English causes poverty because the language dissociates present and future tense… and that as a result a person doesn’t plan for the their future self because they see them as a different person. I was pointed to the article by a mathematician friend who was annoyed that the research (which I freely admit I haven’t read) implies causation when it’s hard to see how correlation could have been ruled out. Prof. Chen, a behavioural economist at Yale, says he believes he has controlled for cultural differences etc. My point isn’t whether, in this case, causation really exists – maybe it does. But I don’t think everyone will read articles like this with as healthy a scepticism as me or my mathematical friend. The media are motivated by sensational headlines, not necessarily balanced truth. But we, the public, reward their choices – right now, this provocative headline is at the top of the ‘Shared’ BBC page list and sixth on the ‘Read’ list. So… Does the responsibility lie with the media to present a balanced view? Or with schools to teach children why they should read any statistical analysis with caution? Or with the statistical community at large to teach everyone? If you really hate someone, teach them to distinguish between correlation and causation. They’ll never manage to read a whole newspaper again without pointing out to you some potentially dodgy research. This entry was posted in Uncategorized by statisticiana. Bookmark the permalink. Hi Rebecca! Thanks for commenting. 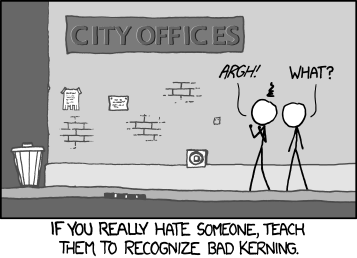 I chose the kerning xkcd (one of my favourites) because I think the point – that the more you learn, the more problems you see – applies to statistics too. In terms of statistics, ignorance is bliss and my blood pressure is worrying… but understanding the potential pitfalls means I think carefully before accepting any conclusions. Was the sample biased? Were the questions leading? What answers aren’t included in the published results? from a political or policy perspective I think all three agencies you identify should deal with it, but the last will be reactive to the first two. If there’s enough of the first two going on and catching them out, the third factor (the media) will have less inclination to manipulate, distort or misrepresent due to the basic sensationalism and sheer laziness which seems to characterise their approach at the moment..